Why is the School doing this? The School of Computing Engineering and Mathematics (SCEM) schoolwide Work Integrated Learning (WIL) Framework is aimed at providing guidance in areas of curriculum design, course delivery and external engagement to the School’s delivery teams when framing their WIL approaches. The Framework seeks to assist staff in developing greater understanding of WIL approaches so that they can improve student experiences and raise students and staff engagement with industry and the community. WIL enables students to trial, experiment and synthesise their academic theoretical 'classroom' knowledge and learning and apply to workplace contexts. Students who participate in WIL activities will tend to develop a greater appreciation of the important of employability skills. The WIL Framework provides coherence to the School's strategy, governance and performance in achieving the WSU strategic objectives for a unique and high quality student learning experience and ensures a systematic and systemic approach is taken across the School. Download the WIL Framework Workbook (XLSX, 134.85 KB) (login required). Replicability and scalability The WIL strategy should be designed and customised specifically to suit the scale of/or unit. Bespoke planning to integrate curriculum design, delivery and resourcing is required in response to cohort sizes. Scaffolding Through the Mapping process, the WIL Framework will identify units best suited to deliver the various aspects of WIL activities in alignment with the scaffolding learning principle to ensure students acquire a signature experience in the course of their studies. A staged approach to WIL whereby learning is scaffolded from first to final year is needed. There are various workplace (eg information/numeracy/digital literacy, effective communication, teamwork, etc) and personal professional skill ( eg problem solving, self management, civic resonsibility, planning) combined with discipline knowledge domains and capabilities (eg discipline specific technical and contextual knowledge, global perspective of the profession etc) that are required together to help , bring students to a 'work ready' state and increase their employability. Implementation plan A necessary part of developing a WIL Framework for a program involves determining how to move from conceptualisation to actual implementation. The management of the WIL activities can at times be extensive. A critical element is identifying the projects/organisations for placements/projects etc. Coordination and administration is key to successful WIL units. WIL experiences typically require set up with organisations in some form and then supervision of the engagement activity. Implementation can be staged and it is important to ensure the various stakeholders (Academic, Student and Workplace Supervisor) are informed of their responsibilities. Curriculum design and approvals, engagement with industry and development of relationships, pilotting/experimentation, evaluation and refinement takes time and should be well planned and coordinated. If a placement is part of the WIL approach then the method for student induction to the workplace, safety and supervision at the workplace, student management and wellbeing during the WIL also take time so that systems are well designed. If other forms of WIL activities are pursued for eg simulation this also takes time to set up. An Implementation Plan should include the roll out of the WIL experience including the various phases, milestones and deliverables. Staff professional development The Director of Academic Program, through the WIL Framework needs to identify any professional development required to build the capability and capacity of staff engaged in the planning and implementation of WIL signature learning experiences. Staff will participate in Professional Development opportunities that enhance their capacity for WIL Learning and Teaching strategies and Partnership development. Professional Development may include aspects of curriculum design, course delivery and/or partnership engagement and management. A critical aspect of the 21 Century Curriculum Renewal project is to ensure that the WIL signature learning experience and various activities leading to this WIL Capstone unit are cocreated, codesigned and codelivered. This may require different capabilities to be instilled in acadamic delivery teams. The DAP should do an audit of the staff capability and develop a program of initiatives in partnership with the Deputy Dean and other stakeholders in the University to ensure staff are provided with every opportunity to undertake professional development. Quality assurance The WIL Framework will guide the scope, description and expectations of the outcomes for the WIL activities in the various units. The Unit Learning Guides may need updating and approval to articulate and communicate to students, the delivery team, stakeholders, partners and Accrediting bodies the outcomes and the methodology to ensure ULOs are achieved. Benchmarking with other institutions can also assist with quality assurance of WIL activities. Evaluation of the success of the WIL activities and the approach is needed to ensure feedback and continuous improvement. Benchmarking The WIL Framework should enable examples of best practice in WIL design, delivery and engagement perspective. Examples may be drawn from innovative and collaborative practices across the higher education sector, nationally and internationally. Sachs et al 2017 report provides a good starting point. Professional orientation Programs in the School tend to be professionally accredited; although it is noted that not all are. There are different requirements across each of the Professional Associations in relation to WIL. Typically WIL is an encouraged activity although in many cases a WIL experience is not a mandatory requirement. There are different ways in which the Professional Associations describe WIL requirements and often number of hours of engagement or hours of study (often termed a placement/internship/project) is a key feature. Employer of choice The WIL Framework proposes a new initiative in the School that recognises Employers that agree to a Code of Conduct and a Partnership Agreement in relation to engagement with the School and placements, supervision and interactions with our students. The aim of the Employer of Choice initiative is to develop a community of good practice and create a culture of co-creation between the key players (students, staff and organisations) to ensure expectations are clearly communicated and met. The Employer of Choice initiative will be an initiative that will enable a network of employers to support co-creation, co-design and co-design of the various WIL initiatives across the programs in a coordinated and cohesive manner. Why is Western Sydney doing this? Western Sydney University is committed to providing “a unique learning experience that is innovative, flexible and responsive. Students will be encouraged and supported to assume responsibility for their learning and to engage with staff in courses that are intellectually challenging, promote excellence and foster the skills and attributes vital to meeting their career and personal development goals” (p.7, Securing Success Strategic Plan). WIL is an umbrella term for a range of approaches that support learning at the intersection of theoretical and practice based learning and typically involves engagement with industrial work and/or community initiatives and incorporates key elements of that 'workplace'. WIL seeks to improve significantly the development of employability skills, career identity and employment prospects for graduating students. WIL experiences build student confidence in their capabilities in professional practice. WIL components being incorporated into units to prepare students for WIL experience. Service learning: involves students engaging in not-for-profit or philanthropic activities/projects with a community partner to experience WIL and civic engagement. Service learning reflects the twin dynamics of experiential learning and service to the community. Industry projects: involve students engaging in projects as individuals or within a team to meet the needs from the industry. These projects require students to integrate their multiple aspects of learning with the practice of work in addressing the industry’s needs. Examples may include: Capstone projects, Industry-driven research projects, or Projects for internal/external clients. Work placement – observational: requires students to be physically attending a professional workplace for a substantial period of time, observe everyday practice of the profession and learn from reflecting on that experience. Structured Practicum: requires students to perform a prescribed list of professional activities and achieve competencies that are determined by professional or industry bodies. An holistic approach is used in the design, development and implementation of WIL which integrates the theory and practice of WIL and is evident in the application of concepts, strategies and approaches in curricula, partnership development and management and organisation/institutional functions. Systematic design of a 'whole of program' WIL curriculum strategy shall be led by the Director of the Academic Program in partnership with the academic delivery team and key stakeholders. A clearly articulated response to each of the three major components (curriculum design, course delivery and engagement) and the subcomponents should be developed through the deliverables as outlined in the Framework, to co-create and sustain curriculum partnerships and renewal. 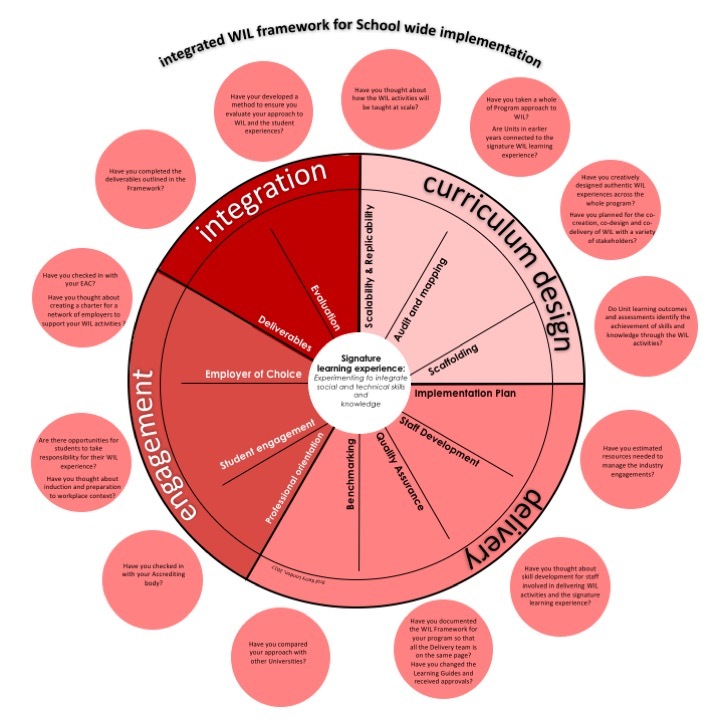 The WIL Framework for a program is dynamic and monitoring and evaluation ensures continuous improvement in curriculum design, delivery and engagement and the student learning experience. Evaluation will ensure the range of activities are reviewed and opportunities for further improvement are implemented. Curriculum is infused with experiential and integrative learning experiences and the full range and level of WIL activities are deployed; ie both 'authentic' (the task resembles those required in professional life) or 'proximal' (the setting resembles professional contexts). Curriculum design is intentional and is linked to and supports learning outcomes, especially around employability and is embedded in the curriculum. The range of activities are carefully considered and purposefully designed to suit the particular program and the characteristics of the professional practice. WIL Capstone signature learning activities include the full continuum of internships, fieldwork, sandwich courses, placements, practicuums, simulations, case studies, project based work and volunteering. WIL activities are designed so that they are accessible to all and provide equitable learning experiences. Curriculum is scaffolded throughout the program of study so that the WIL capstone signature learning experience is the culmination of various different WIL activities. Signature learning experiences are scaffolded across the curriculum from the first to the final year of study. skills to enable an intuitive reading of situations presented to them in the WIL learning experience to ensure full immersion and successful outcomes. WIL activities across the program are located within a variety of Learning Environments; i.e. physical and virtual spaces, online and offline environments, on-campus or off-campus; mirrorring the contemporary challenges and opportunities of changing workplaces, workspaces, resources and schedules. Partnerships are mutually beneficial and reciprocal for future-proofing WSU curriculum and courses. Relationships in the workplace context are created, shaped and solidified through initial and ongoing productive conversations. WIL opportunities are co-developed, co-designed and co-delivered with a variety of stakeholders. Edwards, Daniel; Perkins, Kate; Pearce, Jacob; and Hong, Jennifer, "Work Integrated Learning in STEM in Australian Universities: Final report: Submitted to the Office of the Chief Scientist" (2015).